We discovered Chanticleer almost a decade ago. What a treasure! Our kind of garden. Wouldn’t we love to transplant these idyllic vistas kit-and-caboodle onto our own acreage. Inviting woodlands, rolling lawn, mixed borders and handmade garden furniture spread out, all for our pleasure, and without the distraction of leaky hoses or muddy pickle pails or rusty spades that we forgot to put away. 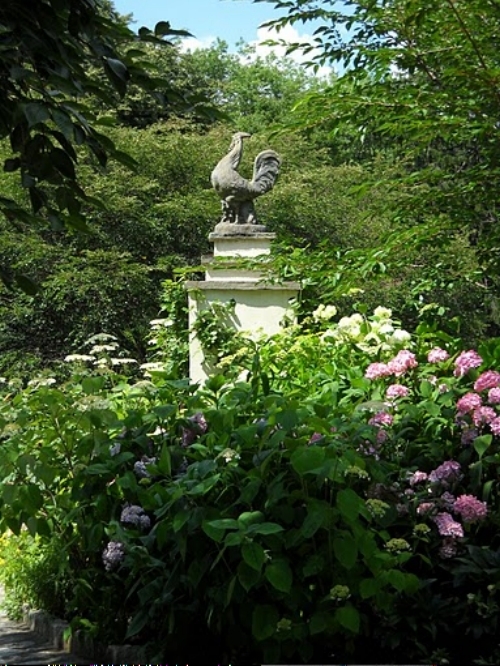 So it’s not surprising that Chanticleer is called a pleasure garden. 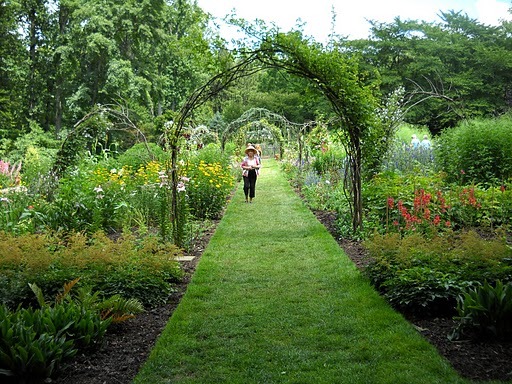 It welcomes kids romping in open space, or grandpa snoozing in a lawn chair, or over-curious gardeners who poke around along the mile-long path to find out what makes this garden so inviting and how we can transplant some ideas (not plants) that we find here. 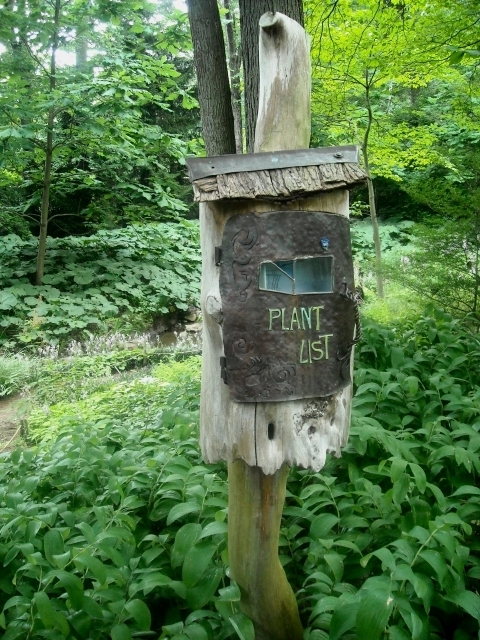 As an added treat for those who must know (or want to collect) every plant in sight, there are one-of-a-kind crafted mailboxes along the way where you can find plant lists that may be purchased. Winters are long here, and the garden is closed, so staff spends time on crafts and hobbies to add whimsy and charm to the garden. 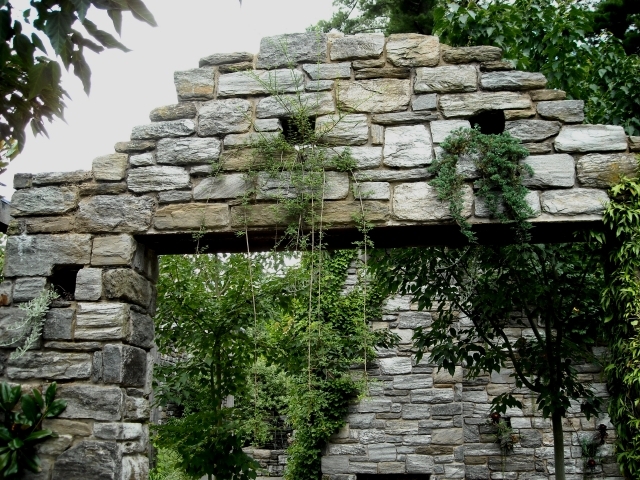 Aptly, the guiding force behind Chanticleer, was a man named Adolf Rosengarten Jr. His interest in gardening was nourished early by his mother who put him in charge of the vegetable garden from seed to harvest. In fact, he tended a World War I victory garden where the pool is today. Adolf’s great grandfather was a German immigrant who founded a family drug company in 1822 that would eventually merge with Merck. 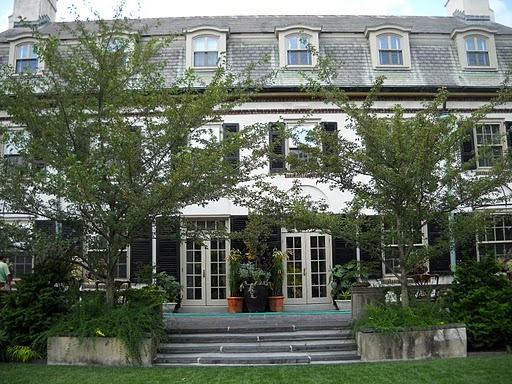 In 1912 Adolf’s father purchased land along the storied Main Line of Philadelphia, a summertime retreat for the wealthy. A small farm, only seven acres, faded, but studded with noble chestnut trees that were expected to play the leads in the garden-that-would-be. The chestnut trees died of blight. (Such is the whiffle-ball of gardening: a grand design whisked away by a tiny fungus.) 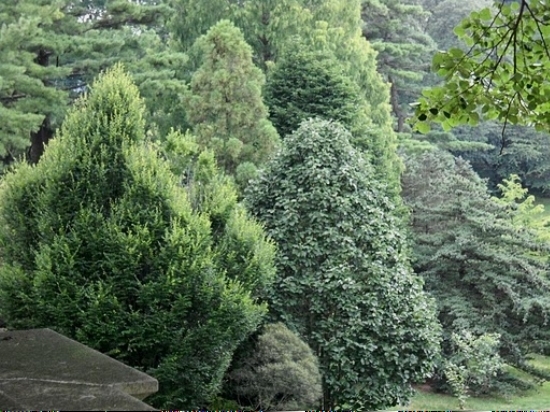 The oaks, pines and beeches that were planted to replace the loss create intimacy and define space and give the garden its sense of age today. When Adolf Jr. wasn’t spying during World War II (unknown to family and friends), or lawyering or philanthropizing, he was managing the estate, gradually laying plans to transform it from a greensward to a vibrant garden. 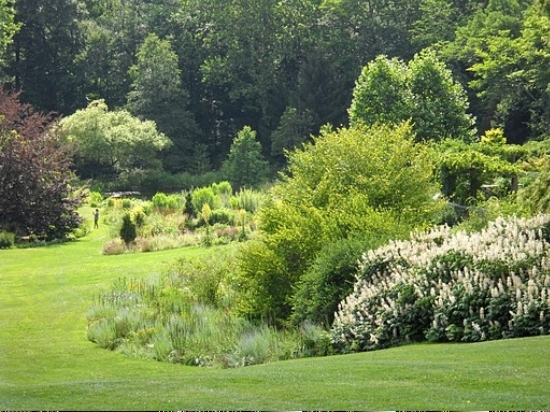 During his last years he set up a foundation and hired a director who would oversee its evolution into one of the country’s foremost public gardens. Today, the estate covers 48 acres (35 of them garden) that include land given as wedding gifts to Adolf Jr. and his sister Emily. 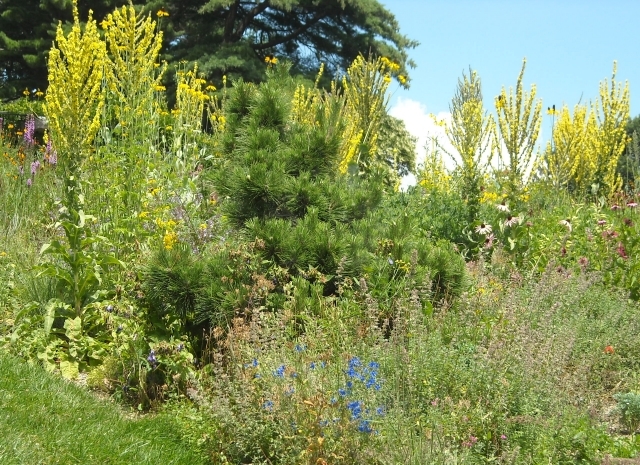 Seven horticulturists design and manage the gardens, or garden rooms, with help from staff and volunteers. 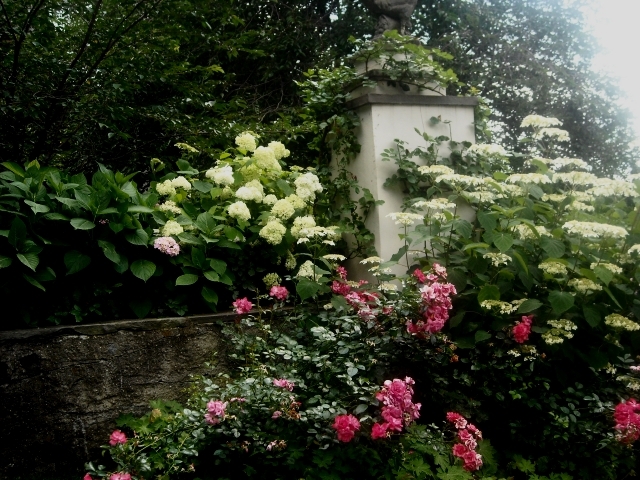 So come and ramble through the garden with us, as we did during high noon on that pleasant July day many years ago. . . The Tennis Court Garden, created out of old clay tennis court, was the first garden room we explored. 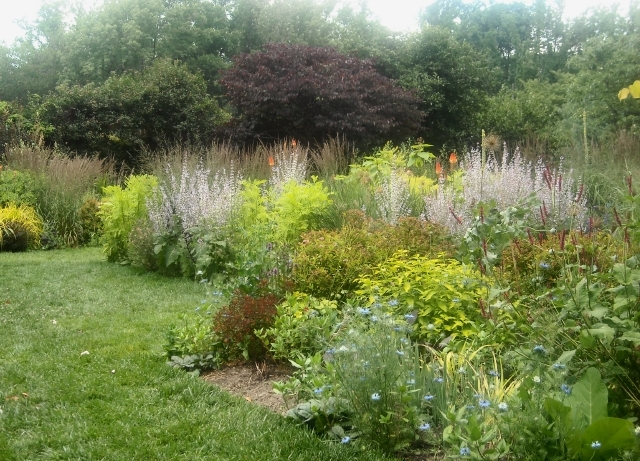 It’s a vibrant mix of perennials, grasses and natives with a medley of contrasting textures and colors . 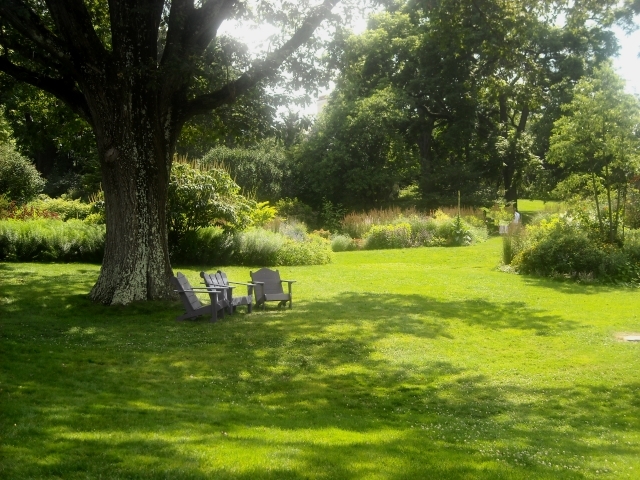 Across the lawn to the Cutting Garden. Here, fresh flowers are grown for bouquets along with fruits and vegetables for the dining table. What a treat it was to spend time talking with the gardener who managed this garden. 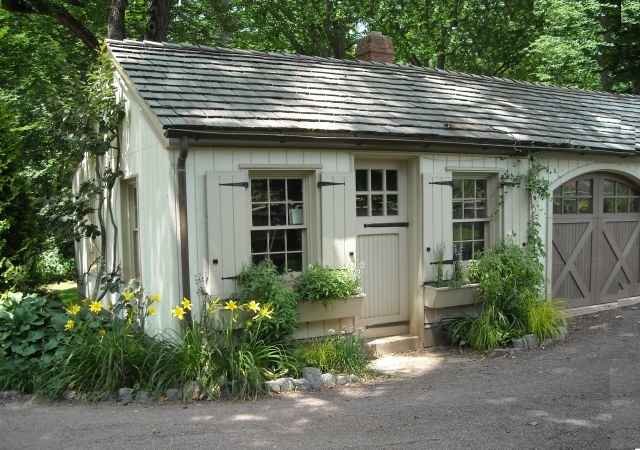 Wouldn’t you love to have a garden shed like this one? 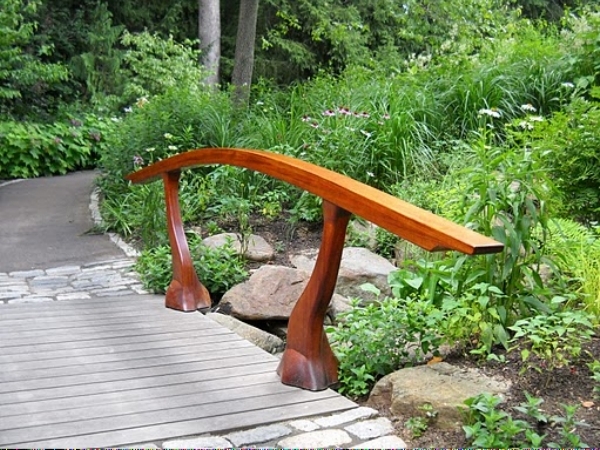 The bridge takes us across Bell’s Creek, a flowing stream with wetland and shade plants tucked into nooks and crannies along the way. 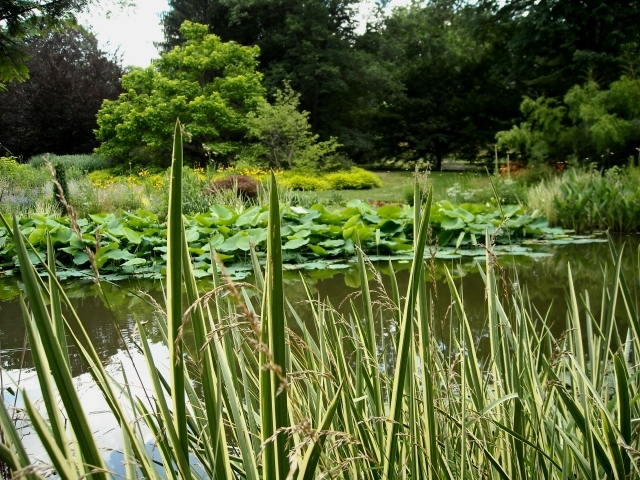 The Pond Garden, excavated from lawn, vibrant and refreshing on this hot afternoon. 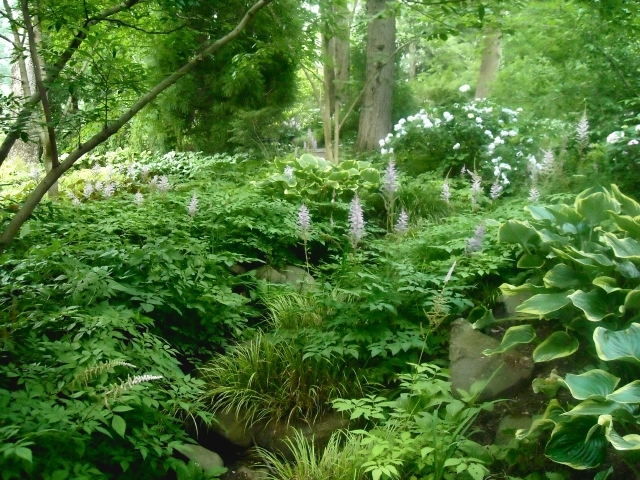 The Asian Garden, one of our favorites, a symphony of evergreens and hydrangeas. The Gravel Garden. What fun! Up a hillside, dry because it’s underlain by, what else? gravel to create perfect drainage. Giant mullein romping up the hill inspired me to grow at least one of these flamboyant plants each year. . 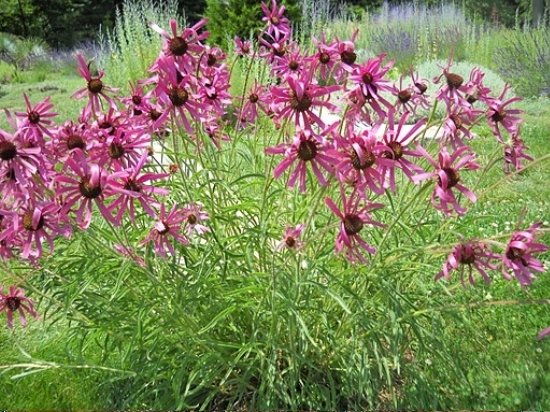 This rudbeckia at the base of the hill captured Susan’s fancy and inspired her to find seed and grow them in her garden. Minder Woods, deep shade, contemplative, a symphony of green. And “The Ruin,” not really a ruin, but the original site of Adolf Jr’s home, torn down and replaced by a folly. So many plants tucked into shady nooks and tiny pots, and a lovely reflecting pool. 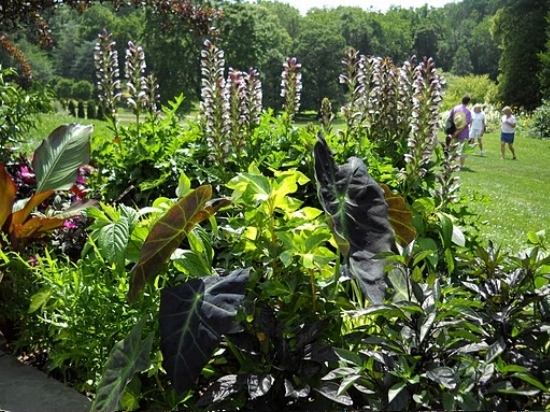 Exotic plantings and hanging baskets on the grounds around the main house were our last stop. A gardener’s delight! We left reluctantly, but not before we decided to return the following day for another delicious visit. We want to return yet again to see how the garden has changed, what new plants have been added, what has been left behind, what clever crafts will make us smile, what new tales the garden has to tell. In the meantime we will look at pictures. . .